World Trade – Who is Really Hurt in a Trade War? The US share markets opened lower on Friday as renewed fears of a trade conflict between the United States and China continued to top the excuses for a correction. This even took the headlines surpassing the lower-than-expected March jobs data which they traditionally have focused on with respect to interest rate hikes. As always, there seems to be zero research into any of these fundamental issues that people hang their hats on to explain corrections or rallies. World trade, even in nominal dollars, peak in 2008. 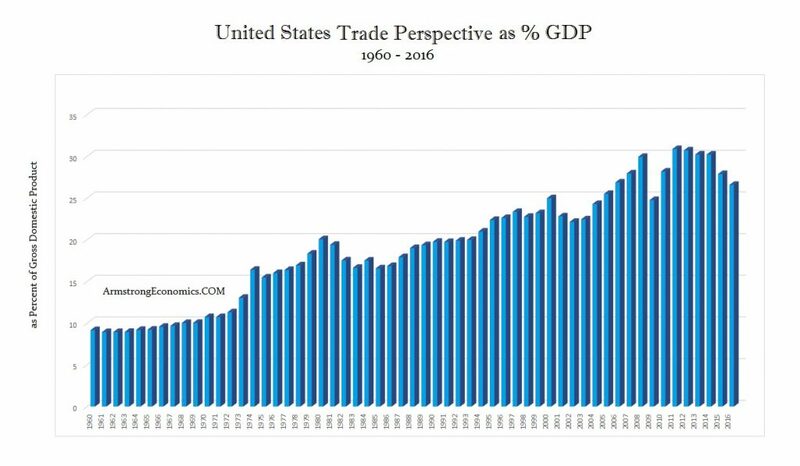 To think that a trade war will somehow reverse the trend is rather absurd. 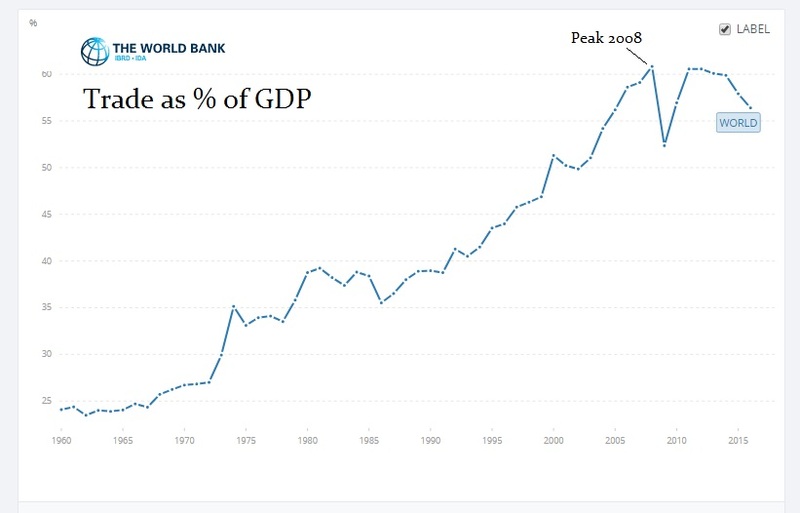 When we look at world trade as a percentage of GDP in China, it has been declining since 2005 and will continue to decline into 2020 even in nominal terms. 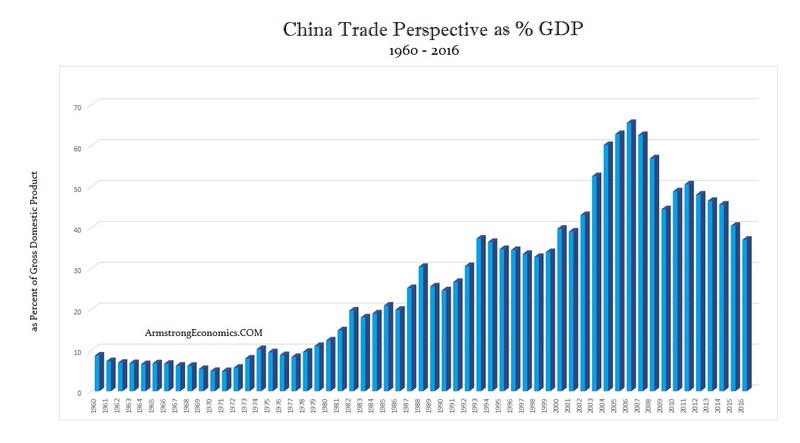 I really hate to burst everyone’s bubble, but (1) there has been a significant decline in world trade, and (2) China has been turning inward building its domestic economy. Trade as a percent of GDP for the United States peaked in 2011. Trump has misread the trade perspective and has only focused upon domestic jobs. If we were to allocate trade according to the parent company, the United States dwarfs most everyone else. The USA also shows that trade is about 26.57% of GDP while in China it is now about 37.05%. This continues to demonstrate that the USA has the primary economy that is holding up the world. Looking at world trade as a percent of GDP around the globe reveals that Canada is 64.3%, Japan 31.23%, Mexico 78.11%, United Kingdom is 58.02%, France 60.46%, Germany is 84.26% and Norway is 67.40% with Sweden coming in at 83.70%. The European Union as a whole stands at 82.62% and the Middle East as a whole stands ar 85.74%. This demonstrates what I have been saying all along that the US economy is holding up the world. If Americans stop buying, the world goes into a major depression. Both China and Japan are below the 40% mark showing that they have been developing a domestic market more so than Europe. The entire push for the Euro was Germany who benefited by selling its products to other countries. Germany is the most dependent European country within the Eurozone of exports standing at 84.26% of GDP. The Middle East beats Germany and now we are for the first time witnessing a shift where countries like Saudi Arabia and UAE are moving to develop their domestic economies and not rely upon exporting oil. The higher the number the more dependent nations are on world trade. The lower the number, the more resilient they are with a strong domestic economy. All the bearishness on selling the dollar because of a trade war is exactly opposite of what the numbers show who will suffer.